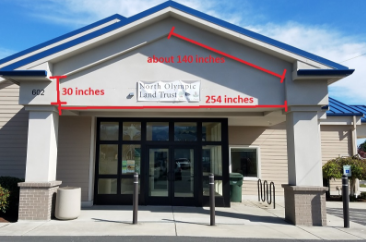 In partnership with the Port Angeles Fine Arts Center, and thanks to the support the Land Trust Alliance, North Olympic Land Trust is seeking a local* artist to create the signage for the exterior, main entrance of the Land Trust’s office located at 602 E. Front St., Port Angeles. This sign will act as the organization's primary signage, and thus needs to be functional and visible. This call is part of the organization’s “Love Where You Live” campaign, which is an ongoing, place-based campaign centered on celebrating and promoting responsible land use and stewardship of the North Olympic Peninsula. The signage should reflect a love for the North Olympic Peninsula. * local = Clallam or Jefferson county and/or has a deep connection with the North Olympic Peninsula. Artist does not need to live in the North Olympic Peninsula year-round. Construction: Creation of art will be done offsite and transported to the Land Trust building at time of installation. The art/sign CANNOT be done directly on the building’s surface. Installation: Sign will be installed by either the artist and/or a professional sign installer. The Land Trust will hire a installation crew, if needed. Dimensions: of space = 164 sq. ft. Available for art = 148 sq. ft. (maximum). Minimum = 100 sq. ft. Location: unprotected, exterior, south-facing wall of single story building above front door/the entrance. Permit requirement(s): Per the City of Port Angeles, the sign must be attached securely enough to satisfy wind standards that apply to the location because it is within 1,500 feet of the shoreline. The Land Trust will purchase necessary materials to securely install, such as bolts/hardware. Be long lasting and durable. Include the Land Trust’s name (North Olympic Land Trust) in clear, visible print. If needed, the Land Trust will work with the artist on lettering and/or hire another party to do the lettering. Include Land Trust’s colors, which are: Dark blue (CMYK = 70/50/15/45) Orange (CMYK = 0/75/100/0) and beige (CMYK = 2/3/4/5). Reflect the Land Trust’s mission and logo of: Farms, Fish and Forests. Timeline: Artist will be selected on Monday, Dec. 18. The artist will have until Tuesday, May 1, 2018 to complete signage and work with the Land Trust on installation. Public reception/unveiling of sign: Artist will participate in a community, public reception at the Land Trust office in celebration of the completion of their work. This will likely occur in May or June. Date TBD, and will be mutually agreed upon between all partners and the artist. Stipend and funds for materials ($1,000). Half (50%) of funds will be given to the artist and the remainder will be given to the artist upon project completion. Additional details to be outlined in an MOU. Permanent wall display just inside the Land Trust office with brief description of the art piece, a short artist biography and any contact information/website provided by the artist. If other, please write in the "Medium" column.